One of the most predictable things (so far, in life) is US Airways’ frequent bonuses for sharing and/or buying miles. Over the past few years, US Airways has consistently offered share miles promotions that allowed one to generate miles at 1.13 cents per mile, making it one of the single most lucrative promotions out there. When US Airways merged with American, many speculated that this might change in the future… and it has. The US Airways Mileage Share Bonus is back this time, only different. The other little change that US Airways implemented is that the bonus doesn’t go all to your recipient, but half of it comes back to you. So where before you shared 50,000 miles, you would end up with nothing and the recipient would end up with 100,000 miles. 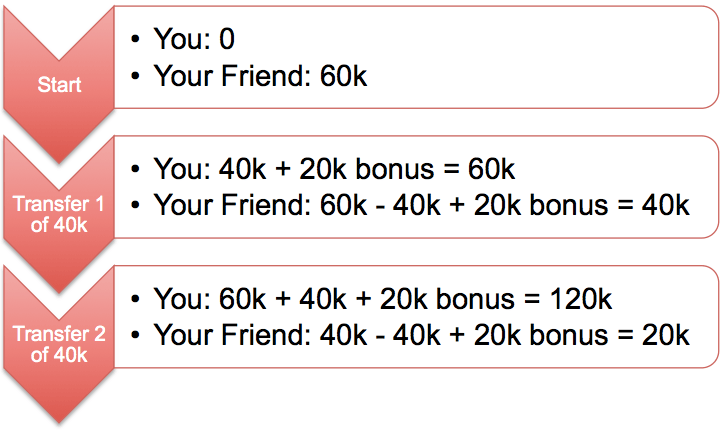 Under the new bonus, you would earn 25,000 miles back, and the recipient would earn 75,000 miles? Trippy? Okay… a little. On this note though, that means another important change. The limitation on bonus miles earned still applies per account, not per trade. In other words, whereas beforehand one trade of 50,000 would earn 100,000 miles, and therefore you would be maxed out on your bonuses for the previous promotion. Under this new promotion, it would take two trades of 25,000 bonus miles each to max out your 50,000 bonus. But wait… your normal trade itself also comes with 50,000 “non-bonus” miles per trade (the miles that are traded from the original account). Multiply this by two trades, that gives you 100,000 miles… in other words, the maximum amount of miles one can earn from this promotion, having zero miles at the start increases from 100,000 to 150,000 miles. Purchasing 120,000 US Airways miles from zero in one promo period is now possible… here’s how. While the price increase is a net loss, the new development allows you to purchase enough miles for a First Class award immediately – something that was never possible with any previous US Airways promotion. Now that you don’t have to split a purchase of more than 100,000 miles over two months (or more), this means you can purchase miles for a First Class award without the risk of devaluation, waiting for promo periods or your award disappearing. Yes, the price increase from 1.1 to 1.5 cents (plus $30 transaction fee and 7.5% excise tax) is a net loss, but at the same time the new promotion format opens up many doors for award purchases which previously weren’t possible without considerate risk. So a loss in one respect, but a gain in another. Be aware of 2 issues. 1. You can’t book JAL flights yet. Does not appear on USDM agents’ screens yet and I was told they are still under negotiations. 2. YQ charges on BA are VERY high. Worse than aeroscam. Space seems unavailable or this is perhaps less players than *A.
I still like it but I wish it was as the old price. Even with a 1 mile per $1 earn on the buy it’s like 1.65 cents each with the fees.